As a mom, it’s my job to pass on my knowledge. Sometimes the things I tell my kids are just simply ridiculous. No, the cat doesn’t want to shower with Mom. Honey, I’m not a trash can (after being handed one too many gum wrappers). Please don’t lick your brother’s hair. The single most important piece of advice I give my kids about being outside is to wear sunscreen every time. 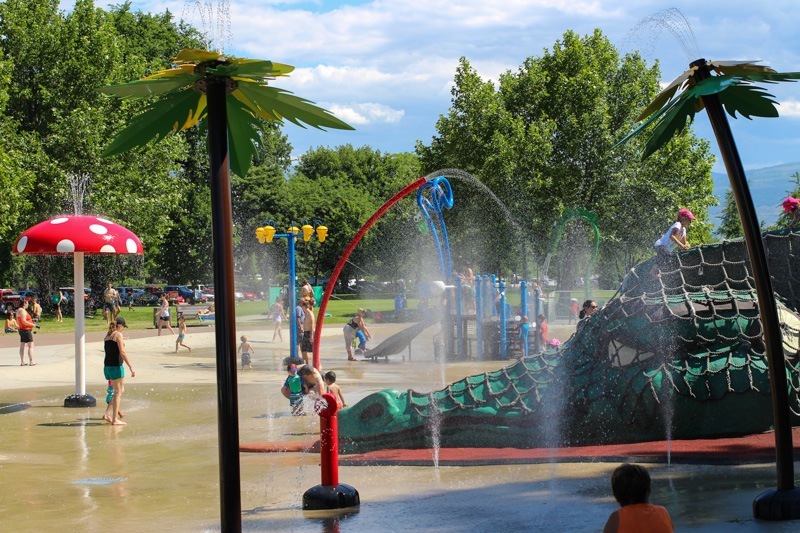 It’s so important because a single severe sunburn in childhood can double the risk of developing melanoma. That’s pretty shocking. Now, I wouldn’t say I’m a granola mom (quite), but I do like to stick to naturally sourced products when I can. That’s why I love sunscreens that are made with zinc oxide. Zinc is a mineral, so it acts by sitting on top of the skin, and reflecting the sun by scattering away ultraviolet rays. Looking for more great, natural products for baby? Here are the organic baby brands we love, and the best organic baby products we love for little ones, and our MyBuckleMate seat belt buckle holder review. I also really love skincare products that help with my dry skin – check out my Ureadin Ultra 10 lotion review here, and where I talk about caring for baby’s skin here. I do find that the AVEENO sunscreen leaves a definite white mark on the skin, which I don’t love. 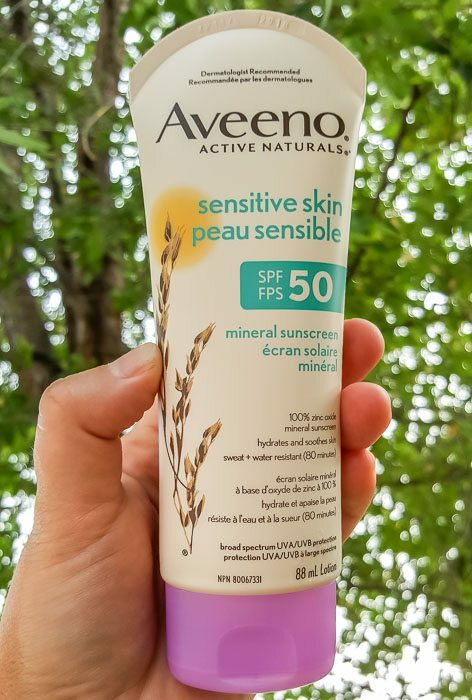 That said, we’ve been using the AVEENO baby sunscreen in the SPF 50 for sensitive skin for a couple of years now, and it’s worked well for us. It doesn’t seem to come off easily (reapply after swimming, though), and it lasts fairly well for us. 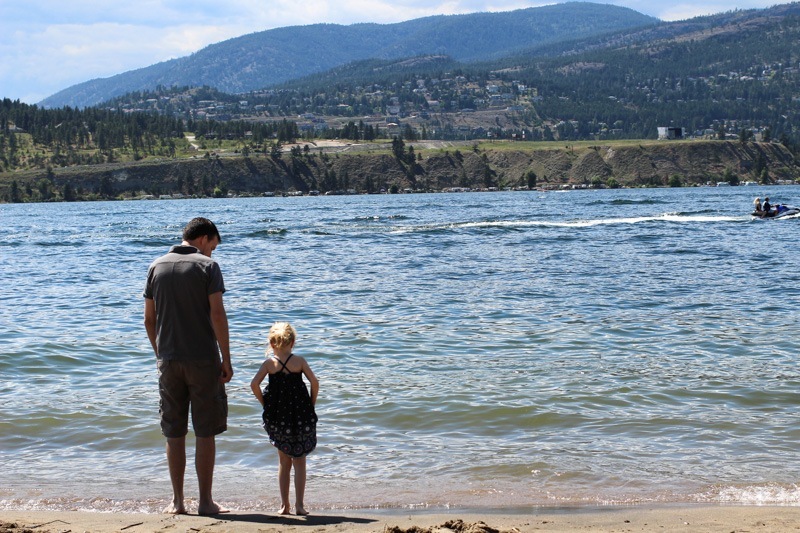 We’ve been using it off and on for two years now – this post was originally written in 2017, and we updated 2 years later since we found we were using the AVEENO a lot and really liking it still. 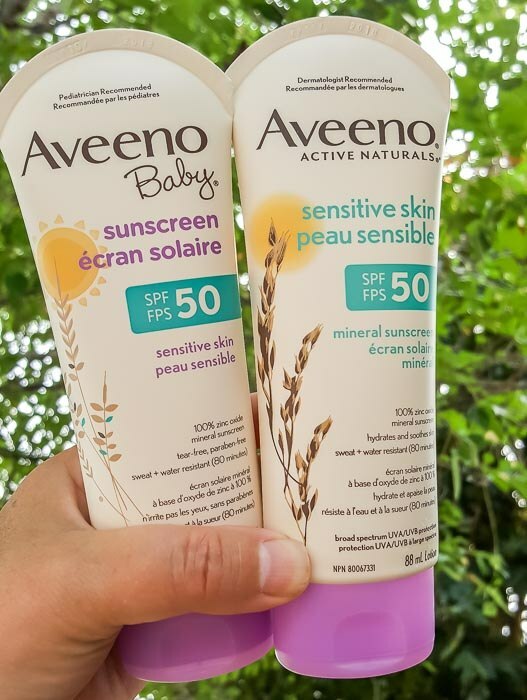 So when AVEENO asked to partner with us at The Parent Spot, I knew it was a great match, and that we’d love to do an Aveeno Baby Sunscreen review! 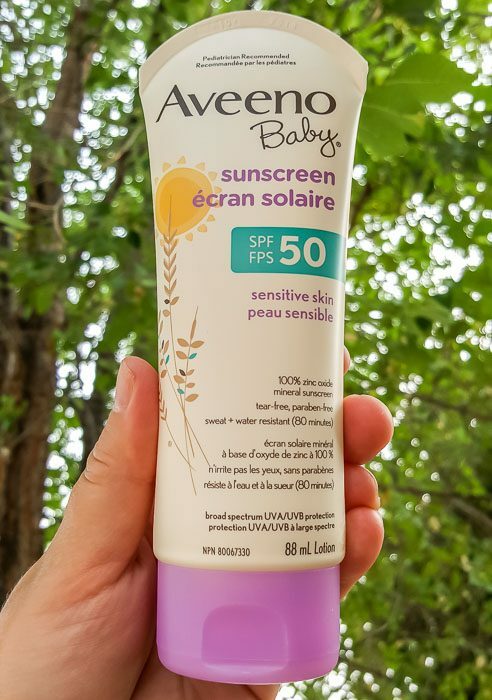 With our busy end of summer lives, plus our fall hikes and outdoor fun that we have planned, it’s the perfect time to see how AVEENO® BABY Sunscreen SPF 50 and the AVEENO® ACTIVE NATURALS® Sensitive Skin SPF 50 mineral sunscreen hold up with our busy family. Why AVEENO? New AVEENO® BABY Sunscreen SPF 50 and new and improved AVEENO® ACTIVE NATURALS® Sensitive Skin SPF 50 mineral sunscreens are formulated with naturally sourced 100% zinc oxide and ACTIVE NATURALS® Oat to combine effective broad-spectrum UVA/UVB sun protection with skin soothing benefits. Finding a great sunscreen like AVEENO means that we’re protected against both UVA and UVB rays. The AVEENO sunscreens are water-resistant for 80 minutes, but always be smart about re-applying sunscreen when you’re out in the sun and water. Our last summer afternoon we spent about four hours outside, going from pool to relaxing in the hammock to enjoying summer snacks. I always made sure to re-apply after splashing around in the pool. 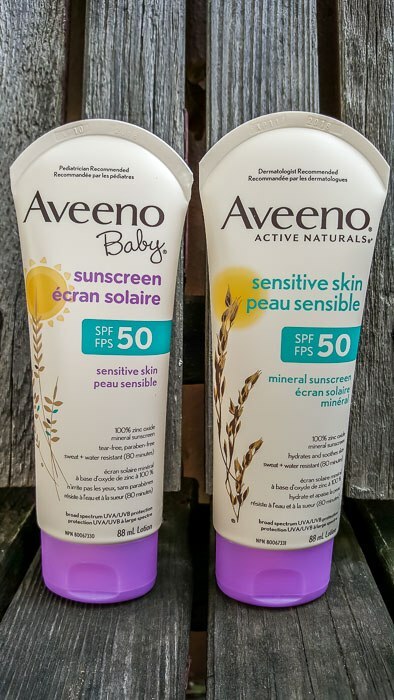 So, what else do you need to know about AVEENO BABY Sunscreen SPF 50 and AVEENO ACTIVE NATURALS Sensitive Skin SPF 5? 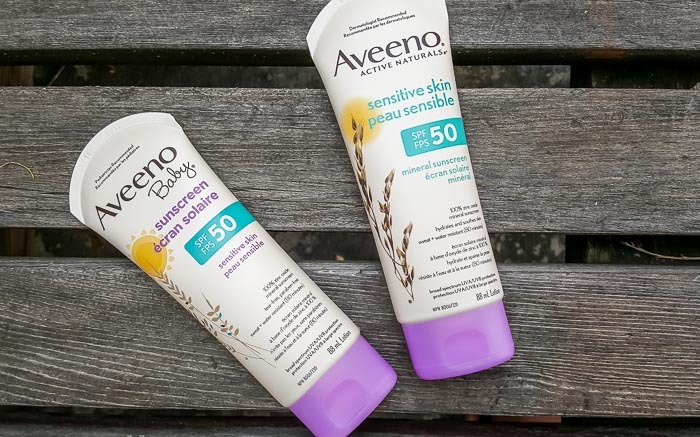 AVEENO® has partnered with a gemologist & top Toronto dermatologist, Dr. Paul Cohen, to help introduce you to their new zinc mineral sunscreens, so you can protect yourself all summer and beyond. You can buy Aveeno products in Canada at Rexall. great post. sunscreen, especially for kids is so important. good tip to get them in the habit early!